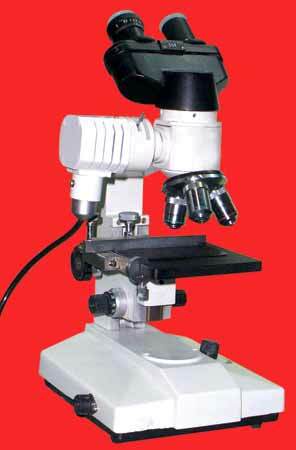 For study of metal micro structure, alloys, semi-conductor device & all opaque materials. Fitted with Binocular Head assembled from hard coated prisms. Bright field horizontal illuminator with centering provision. Quadruple revolving nose piece, Straight Tube for microphotography & special Graduated Mechanical Stage. Supplied with variable light control transformer.